Folks talk a lot about things like sacrifice and heroism up in the Texas Capitol. But right outside, every day, there’s a guy who’s seen more of those things than most of us can imagine. His name is Robert Bernal, He’s 85-years-old, and he works as a parking guard on the driveway running around the east side (which is the Senate side) of the Capitol. I see him pretty much every day during a session. He’s always smiling. And every time I’ve seen him for more than four years now, he always shakes my hand, we exchange the standard “how’re you doing,” and then, without exception, he wishes me good luck. Because of who he is, Mr. Bernal’s greeting is always a pleasure. Because of what he’s done, it’s always an honor. Robert’s a veteran of World War II, and a participant in one of its fiercest battles – the fight for Iwo Jima. 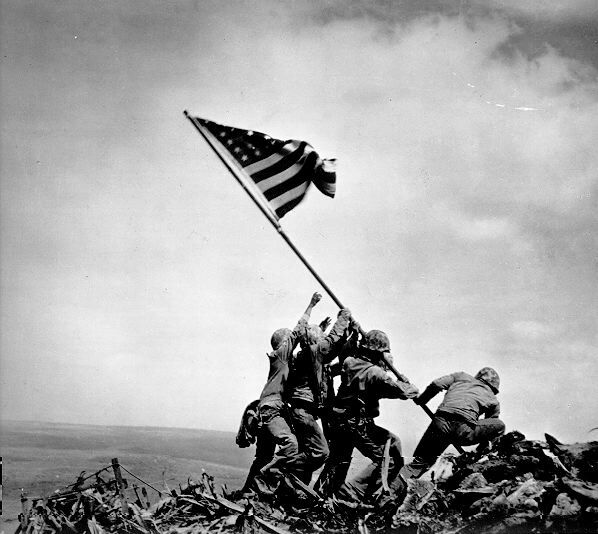 This, of course, is the battle in which a photographer captured the iconic image of Marines raising the American flag in the midst of the fight. It began on Feb. 19, 1945 and finally ended on March 26, 66 years ago this week. Robert was part of the crew of one of the landing boats that carried men and equipment on the perilous stretch between the American boats and the beach of the Japanese-held island. But before that, he was a 17-year-old kid from Austin who got permission from his parents to enlist early in the U.S. Navy. Trained for the landing craft, he took care of the ropes and cables, lowered the ramp to unload whatever they were carrying, and manned a machine gun. Robert saw a lot of the war in the Pacific, from the aftermath of the battle of Guadalcanal to the Phillipines invasions. Then, his crew was sent to Iwo Jima. Military planners expected the battle to last about a week. Instead, it raged for more than a month. Japanese troops were literally dug into the island, with most fighting from well-defended bunkers. By day, Robert’s boat pushed through the wreckage of the battle and the swarm of bullets and shells to deliver supplies and reinforcements to the Marines. At night, he helped man a machine gun, watching out for enemy saboteurs. A few days into the battle, the Marines raised the American flag. It was visible from the beaches and the water, inspiring Robert and thousands more Americans who were fighting that fight, and helping give them the strength to win it. In the end, more than 6,000 Americans and about 18,000 Japanese were killed in the battle. Another nearly 20,000 Americans were wounded, and 27 Americans were awarded the Medal of Honor for their actions at Iwo Jima. 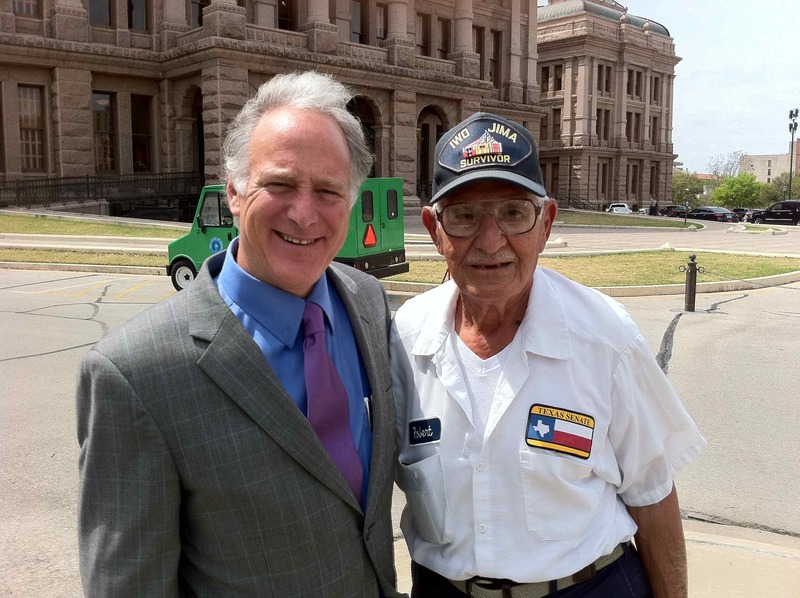 And 66 years later, this man who did so much for our country is still working for the people of Texas – keeping an eye on things around the Capitol and kindly passing on greetings to me and so many others who walk past. When this happy, heroic man touches me, both by taking my hand and wishing me good luck, I always feel special. It’s more than just the symbolism of what he’s passed on to all of us. He graces and empowers me. And I always walk away feeling that this special patriot has entrusted me with – he’s delegated to me – the obligation to do right, to do all I can as well as I can, as I walk into his Capitol.